Thousand Oaks, CA — According to recently released statistics from the American Society of Plastic Surgeons (ASPS), breast augmentation is the most popular cosmetic surgical procedure and BOTOX® Cosmetic is the most popular nonsurgical enhancement. 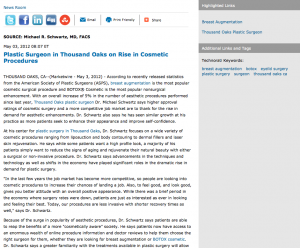 With an overall increase of 5% in the number of aesthetic procedures performed since last year, Thousand Oaks plastic surgeon Dr. Michael Schwartz says higher approval ratings of cosmetic surgery and a more competitive job market are to thank for the rise in demand for aesthetic enhancements. Dr. Schwartz also says he has seen similar growth at his practice as more patients seek to enhance their appearance and improve self-confidence. At his center for plastic surgery in Thousand Oaks, Dr. Schwartz focuses on a wide variety of cosmetic procedures ranging from liposuction and body contouring to dermal fillers and laser skin rejuvenation. He says while some patients want a high profile look, a majority of his patients simply want to reduce the signs of aging and rejuvenate their natural beauty with either a surgical or non-invasive procedure. Dr. Schwartz says advancements in the techniques and technology as well as shifts in the economy have played significant roles in the dramatic rise in demand for plastic surgery. “In the last few years the job market has become more competitive, so people are looking into cosmetic procedures to increase their chances of landing a job. Also, to feel good, and look good, gives you better attitude with an overall positive appearance. While there was a brief period in the economy where surgery rates were down, patients are just as interested as ever in looking and feeling their best. Today, our procedures are less invasive with shorter recovery times as well,” says Dr. Schwartz. Because of the surge in popularity of aesthetic procedures, Dr. Schwartz says patients are able to reap the benefits of a more “cosmetically aware” society. He says patients now have access to an enormous wealth of online procedure information and doctor reviews to help them choose the right surgeon for them, whether they are looking for breast augmentation or BOTOX cosmetic. Dr. Schwartz says a greater familiarity with the treatments available in plastic surgery will allow patients to make informed decisions and will also help promote the safe and effective practice of cosmetic treatment. “As plastic surgery procedures become more popular, so do the doctors who perform them. Patients can better educate themselves by looking at a doctor’s website, before and after photos, as well as referrals and ratings. Make sure they are certified by the American Board of Plastic Surgery. The popularity of these procedures is helpful for patients because they are finally learning how to research who is qualified to do their surgery,” says Dr. Schwartz. Dr. Schwartz says some of the current most popular procedures at his practice are those associated with the mommy makeover: a combination of several body contouring and breast surgery enhancements designed for post-pregnancy women. He adds that facelifts and tummy tuck procedures are increasing as well, an observation reflected in the latest ASPS surveys. He also says there has been an unprecedented rise in isolated necklifts and fat grafting for buttock augmentation procedures, which have not been as popular in the past. Thanks to a host of options available to patients, Dr. Schwartz says plastic surgery can now provide some of the safest and most effective improvements in a person’s physical appearance and self-image. Whether patients are looking for minor procedures such as dermal fillers or a more significant enhancement like breast augmentation or eyelid surgery, Dr. Schwartz says with the increased popularity of aesthetic treatment comes a necessity for proper research and patient education. He stresses the importance of consulting with a board-certified plastic surgeon and a practice that provides personalized, individual treatment and an attentive approach to patient care. “I would hope a person who chooses a plastic surgeon, chooses wisely by researching the doctor, not the cost of the procedure. It will end up costing a lot more if it has to be redone,” he says. Dr. Michael Schwartz is double board-certified and an active member of the American Society of Plastic Surgeons and the American Society for Aesthetic Plastic Surgery. He completed his plastic and reconstructive surgery residency at the University of Texas Southwestern including extensive training in cosmetic procedures. Dr. Schwartz is a Fellow of the American College of Surgeons, a member of the Mentor Educational Council, and has been published in numerous papers and journals concerning plastic surgery. Located at 696 Hampshire Road, Sutie 210 in Westlake Village, CA, Dr. Schwartz’s practice can be reached at (805) 435-8256. He can also be contacted online via the websites drschwartz.com or facebook.com/drmschwartz.